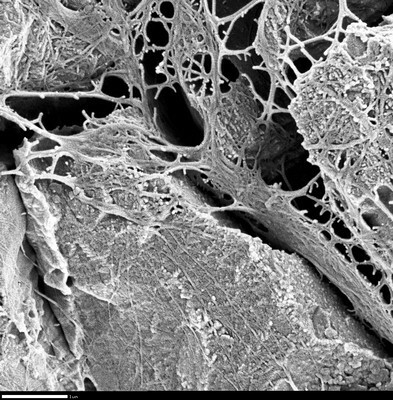 "Another overview of large filamentous film showing texture coating cry" by George Braybrook, Leslie Melim et al. Cave: Hidden Cave, State: NM, Country: U.S.A. Image Type: SEM Image, Scale Bar: 1um, Magnification: 15000, Etch: No etching, Coating: Au, Instrument Location: U. Alberta, kV: 5, Scan: med, Spot Sz: 8.